Before we get into the project, I want to let you know a special occasion I am celebrating this week. 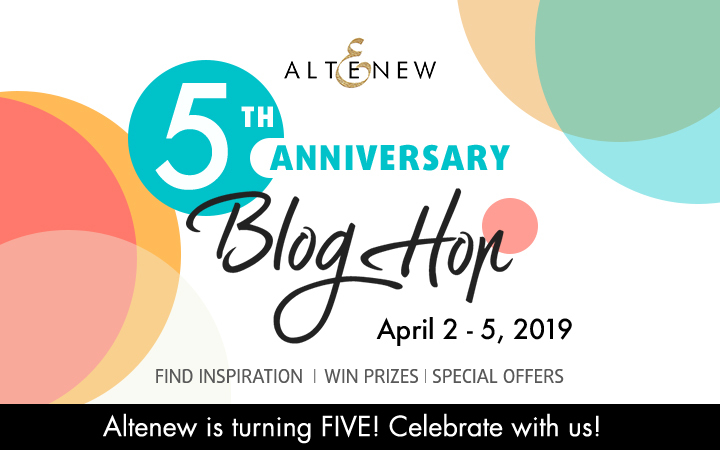 Altenew turned 5 this month and there is a week-long celebration of blog hops, giveaways, and shopping spree!! 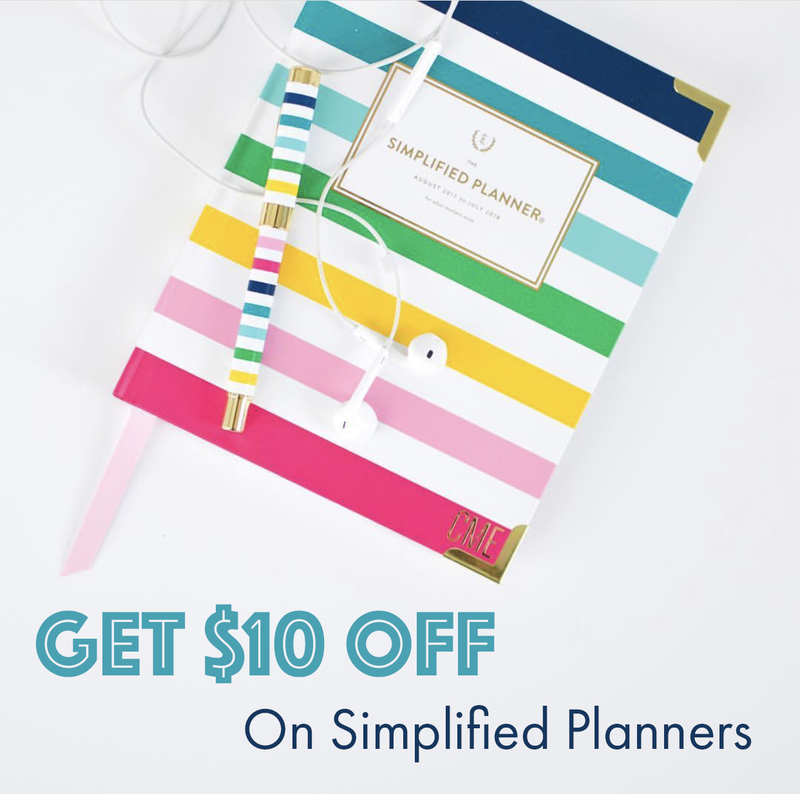 Make sure to scroll all the way down for fun giveaways, shopping discount codes, and more at the end of the blog post! I have been fascinated with the concept of transparent watercoloring. I am FAR from being good at it, but I have been practicing and getting comfortable with the technique itself. There are so much more I need to learn and be good at, but I felt some of you might enjoy this when making cards. So here goes! You can see how I created today’s card by watching the video tutorial above. Since it is hard to explain the technique fully in text, I will be keeping the text portion of the blog post short and sweet. You can see lots of pictures of today’s card below though, with few comments on the products I used. Airy, flowy, and light look is what I wanted to achieve in this project, along with some detailed look. To create a various look on the watercolor project, I used size 8, size 6, and size 4 watercolor brushes. A stamped image is a great way to give yourself a guideline when doing this technique. I chose the Sweetest Peas stamp set and the coordinating die set for today’s project. Two colors were used mainly to complete the watercolored look. Permanent Rose and Sap Green. I used the Mission Gold watercolors for today’s card, but you can use any color of your choice! I highly, highly recommend using a good watercolor paper. I use the 140lb cold press watercolor paper by Arches. Make sure your paper handles water well for this technique. I hope you enjoyed today’s video tutorial! I would LOVE to see your projects if you ever give it a try. Make sure to tag me when you share on social media! I will make sure to comment and share my love with you! Hop along with us to get awesome project inspirations! Next stop on the hop is Flora Monika Farkas! Make sure to stop by and leave some love for her! Please see below for the full blog hop list. I love the light and airy look to your sweet peas. It looks beautiful! I will definitely try it out! Watching the video now! I love watercolor and yours is beautiful. Your card is so pretty and delicate looking! Wow..looks very beautiful..those petals look really delicate ,fab job colouring them !! Gorgeous card. Thanks for showing us how to recreate the look! Thanks for the great tutorial. You explained everything so well and the card is beautiful!!! many thanks for sharing your talent with us. Can’t wait to try this technique as soon as I complete the blog hop!!! What a lovely technique, perfect for those dainty sweet peas. Love that stamp set, too! Gorgeous card! Love the soft colors. Beautiful card. Love the watercolor technique. Thanks for sharing. Hello Nicole! I I just want to say that your card is amazing. I love the technique and I hope to give it a try on a card pretty soon. Also I want to know I appreciate all your efforts you do in order to keep us inspired. Thank you, have a wonderful and blessed day! I really want to get better at watercolor with markers or paints. Thanks for the helpful video. I just love this technique! I struggle with the idea of “no line” watercoloring, and for some reason, this technique seems to make more sense to me, so I think I’ll be giving it a try real soon! What BEAUTIFUL watercoloring! GREAT card! Happy Anniversary to Altenew!!! Wow, Nicole, your card is so lovely! I wish I had that much control when watercoloring. You are very talented! thanks for sharing your watercolor technique – give such a lovely result! This was amazing. I have never seen this technique. Thank you! Very pretty card and flower…I like the soft touch of the color pink…..
Sweet, Sweet Peas card! Thank you for sharing what you have learned about the no line watercoloring technique. Happy Anniversary, Altenew! Thanks, Nicole! I learned something new today, which is always fun. 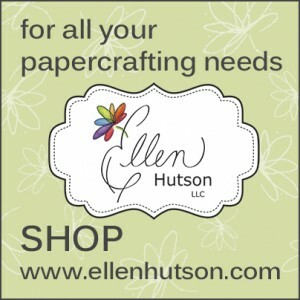 Love your sweet peas card! Beautiful Card Nicole! Great technique!! Thank you for sharing you talent with us. Thanks for showing this technique. I love watercolor and want to learn all the various styles. Your card is beautiful btw! Love your technique! Can’t wait to try it. Another wonderful design Nicole! Love this stamp set. Happy anniversary to Altenew!! Love your card and the watercolorin technique. it is lovely.Today i water colored using water color pencils and as you say i must find a good paper. Thank you for the tip. Beautiful! Love the no line watercoloring! Stunning! Beautiful card… the flowers look so delicate. Lovely card. TFS the video showing your water coloring technique; it really creates a pretty and refreshing effect. This is the first time I have seen this very airy, light and transparent watercolor and it is so very pretty Nicole. I shall have to try it! Thank you Nicole for this great video and instructions. I will be giving this a try. Love the look of it. And your card is so refreshing. beautiful water-coloring.. just love the sweet peas.. Happy Birthday Altnew..
Looks like you mastered transparent watercolor to me! I can’t wait to give it a try. Gorgeous creation, thanks for the video! Altenew, CONGRATULATIONS on your 5 year anniversary! What an awesome celebration! Nicole, your card is just lovely! Thanks for the great video and the tip for taking the watercolor away with a “dry” brush. Watercolor is such a versatile medium, and you have given me another idea to try. Beautiful card. Lovely “soft” card. I’m just trying to get a hand on watercoloring,, and I know I have a long way to go. I’m not even going to attempt to do the soft coloring yet. Watercoloring is something I haven’t done yet so thanks for showing me what to do. Thanks for the video but your pictures are just as valuable. Beautiful card. Very pretty!! Love the soft colors! So delicate looking, very pretty. 2 words: Lovely & elegant!!!! Delicate and beautiful Thank you for sharing your ideas with us. Congrats Altenew. Love this coloring technique. It definitely looks airy and delicate but still defined. Awesome job. Thanks for sharing your creativity! Thanks for the inspiration and congrats to Altenew! Such a pretty card! Thanks for sharing your watercoloring technique. Very beautiful and elegant! The flowers look so delicate. Thanks for the video showing the water color technique! Nicole, your card is beautiful. You make the technique look so easy so I must try it myself. Beautiful card. I loved the video. Lovely watercolor technique! 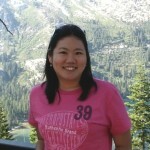 Thank you for sharing! Such a soft pretty card. I’ve the soft pinks. Very pretty. Beautiful, soft sweet peas. I love this set and use mine often. Love sweet peas and therefore love the Sweetest Pea stamp. Didn’t know how I was going to use it. You’ve given me an idea. Thank you! Your card is very pretty. Love the pink flowers! 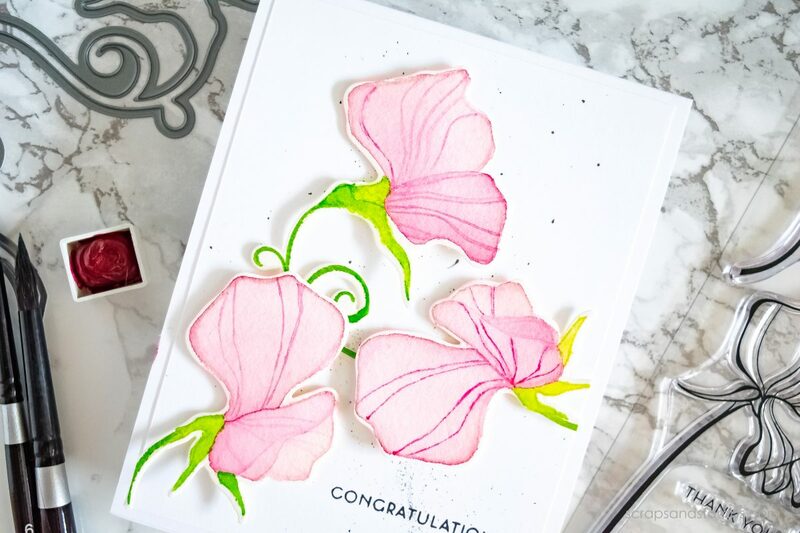 You achieved your goals of creating a light and airy flower and a beautiful card. Thanks for sharing your talent and the how-to for the project. Love the watercolor flowers. Happy Anniversary Altenew! Beautiful card. I love the transparent coloring technique and the Sweetest Peas set is wonderful for it. Absolutely beautiful and you make it look so easy! I love your watercolor flowers! This is such a beautiful design , and technique. Thank you for sharing it, and encouraging me to try. Love this technique. Such a beautiful card. Thanks for sharing this great technique. Your card is lovely. I can’t wait to try the technique. Thank you for the inspiration. So sweet and soft! I am inspired, must put that set in my wish list! Love the soft look of the flowers on your pretty card. Thanks for the video showing this technique. Beautiful results! 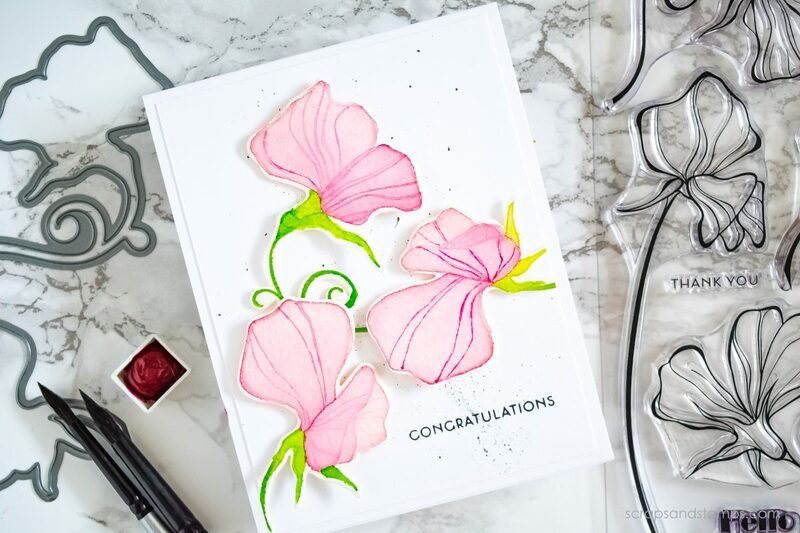 Your pink sweet pea watercoloured card is gorgeous! Beautiful card. I love those flowers they are so dreamy. Thanks for sharing the technique. I can’t wait to try it. So beautiful Nicole – great video to explain the technique. I think you have great patience. Beautiful card and great technique. Can’t wait to try it. Great video & lovely technique. Very pretty card. What an amazing card, so light, airy & transparent. The Altenew stamp set is perfect for this technique! Thanks for the inspiration! Such an elegant card design! Beautiful card! So light and airy and oh so pretty! Huge congratulations to Altenew for five years of amazing products and inspiration! Very pretty Nicole. Love the pretty pink hue on the flowers and how they looked popped up. Happy Anniversary to Altanew! Just got this stamp set recently and you’ve inspired me to get it out and make something in pink! Ah, watercolor! Always fascinating d SO much tolearn. Thanks for sharing! Loved your video, Nicole! I will have to try that technique with my watercolors. The sweet peas look so pretty in that pale color. I love your water coloring! So soft and pretty! Really pretty card, perfect pale pink for sweet peas. I love sweet peas—lovely card. Aaah how cute is that! I love everything pink and floral-y! Thanks for sharing! Love the soft watercolors on these flowers. Stunning watercolor effect! This is gorgeous, and I can’t wait to try it! I have not tried watercolors yet. Love your card and the soft pink. Such a soft, lovely creation and thank you for the video – I’ve bookmarked it so I can watch it several times! So pretty! I love the soft pink color used on this card. It is a very simple, yet clean design. This is such a pretty, delicate card. Love your video explanation. Beautiful water coloring! Happy Anniversary Altenew! I believe you achieved airy, flowy, and light on your beautiful watercoloring. Thank you for the tips. So cute! I just love sweat peas. Stunning card. Happy 5th Anniversary Altenew! I haven’t seen this technique before. Thanks for a great tutorial, and a very pretty card idea. very cool technique. I’ve never seen that done before. I love the lightness of the color. TFS! Your card looks great…..when I try watercoloring….it is a hit and miss….I just need to just keep working on it….they turn out pretty sometimes…I feel that is my lucky day, when that happens…LOL….but I continue to keep trying. 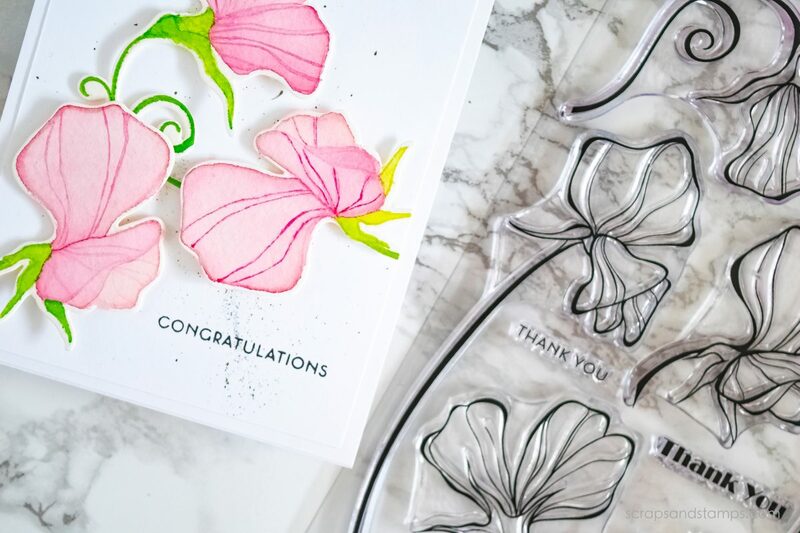 Altenew has some pretty gorgeous floral…so that is a great start….thank you so much for sharing your lovely card. Pretty card, Thanks for the chance to win and sharing. I just love everything about your card!! I have been experimenting with water coloring too and you gave me some great tips!! I already have this stamp and die set, so now I can experiment with your technique!! Your watercoloring is so delicate and beautiful! I adore this card! Absolutely stunning card Nicole. Thank you so much for the hints and tips. I cannot wait to give this a try. So delicately beautiful! Thank you for sharing. Happy 5th Anniversary Altenew! You have certainly created the light, airy look on this card, Nicole! So pretty! Thanks so much for sharing and for your wonderful inspiration! Oh wow! The coloring on those flowers are just stunning!! Wonderful watercolor. Thanks for sharing with the video. Happy 5th anniversary Altenew! Love this technique! Your flowers are beautiful! Thank you for sharing. Happy Anniversary Altenew! Beautiful card. Thank you for the watercoloring lesson. Very lovely. I need to do some water coloring. Oh wow! These flowers are so soft and delicate. After watching your video I appreciate your card even more. 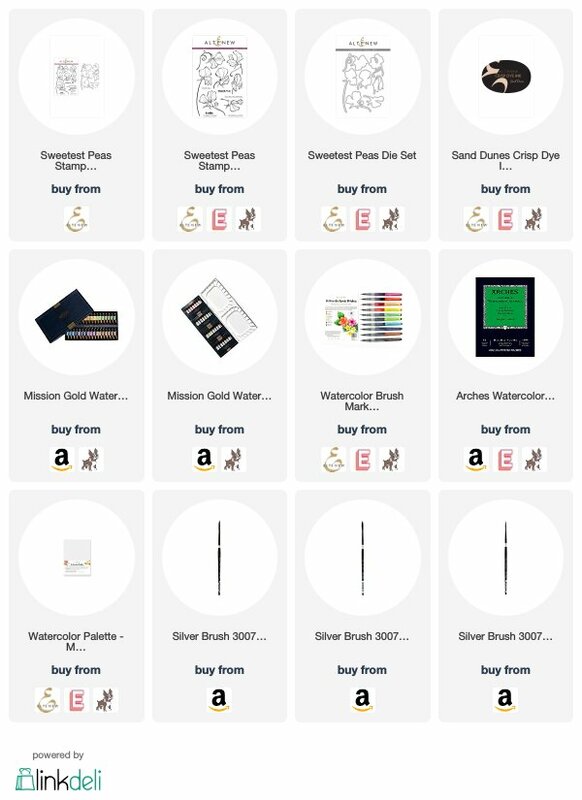 Thank you for sharing the technique…..I can’t wait to try it! LOVE your pretty card and Atenew!! Very pretty card! I love sweet peas! and your coloring is very soft and pretty! Very pretty card. Love the soft coloring! I have never seen this coloring technique and I can’t wait to try it! The video was great. Your instructions were very clear! Thank you! Incredebly awesome Nicole, your transparant watercolouring is stunning! Wonderful watercoloring technique! Your card is beautiful! Love the soft look to this card. Beautiful card and I love the pink and the splatters of black in the background. Great job! Fabulous card and video! Love the colors and your wonderful style. Love the sweet pea stamp and die set you used and your technique for coloring. I have never seen a technique like this before. This is so pretty! Thank you so much for sharing this with us! Love the transparent watercoloring technique and I love your fantastic card in my favorite color!! so pretty, your video is excellent. thank you for showing that. I love this stamp set, and you achieved the perfect light pink for those blossoms. I just want to sigh over this card like a lovesick schoolchild. Thanks for sharing! Nicole your card is lovely! The sweet peas look so delicate & almost ethereal. Thank you for taking the time to make the video to show your process & BTW your voice sounds just fine. Happy5th Birthday Altenew! Your card is beautiful. Thanks for the video. I am going to try this. Love your card. Thanks for your video. What a lovely card. Nicole! I love that water color technique….it gives such a soft, airy look to the flowers. Thanks for the video showing us how to do this….very helpful!! Your pretty pink flowers were just what I needed to see today – it is a dreary day here, and they made me smile! Many thanks! Love your pretty pink flowers! I lovely card, Nicole!! This pink is so soft and dainty!! I love it!! Wonderful card. love it a lot. Thanks. I love the transparent and airy look of your flowers. I can’t wait to try it myself. TFS. This is a really beautiful card. I’m not very good at watercoloring but think I will give this technique a try. Thanks for the inspiration. These flowers look so light and dainty! Such beautiful sweet peas! This set has been on my wish list! Love the transparent watercolors. Such pretty pink flowers! Pretty technique! Love the Sweetest Peas stamp set you used and the soft pink color of the flowers. Thanks for the video tutorial! So soft and pretty. Thanks very much for sharing. What a pretty card, just love those soft delicate flowers! Thanks for sharing this card! Happy with anniversary! Thanks for this card! I love sweet peas. You did a great job. Beautiful color choise. Transparent watercoloring, wow! This is spectacular. Your card is wonderful. I love your color scheme! Amazing card! I love your work. 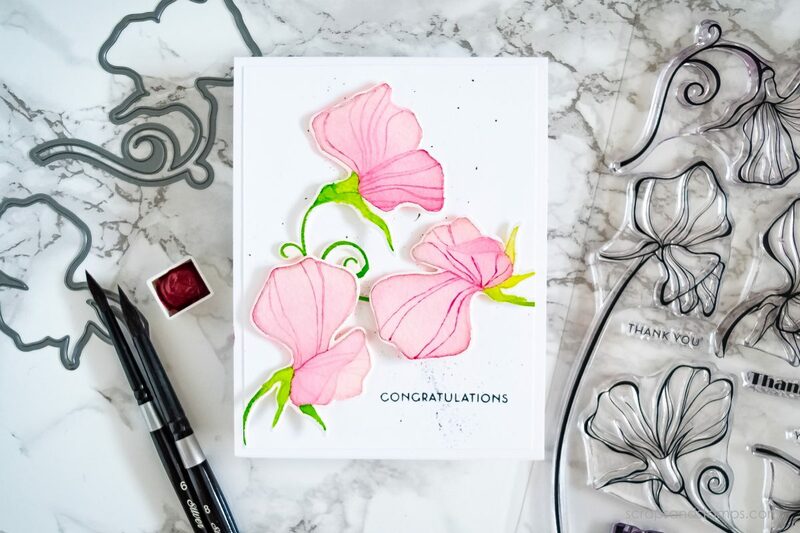 This is one of my favourite stamp sets and I just love the card you made with it – gorgeous! Beautiful transparent sweet peas! Lovely card. Beautiful card ! Great technique ! Very clear video explaining it — you make it look doable, Thanks ! Great tutorial for this lovely flower, Nicole. I really like the soft look the no-line watercoloring achieves, and I think after watching you do it, I am ready to try! Happy Day #2! Gorgeous, love the soft effect you get with the watercolors, just beautiful. Thanks for sharing and Happy Anniversary Altenew! Happy Birthday Altenew and many more! Very soft and delicate looking card! Great job! Interesting technique and I love the outcome. Thank you for the inspiration. Congratulations to you for being courageous and accomplishing something that you aren’t comfortable with. Thanks for sharing with us. The video was totally helpful and fascinating and I really enjoyed it. I so want to try it and will soon. Very beautiful card. Love the flowers and the soft pinks. Thanks for the inspiration! Love sweet peas! I wish you could make it a scratch and sniff card. Happy birthday Altenew! I love supporting an American company with my craft dollars. This set is going to be on my wish list! Thanks for sharing your talent – Gorgeous card and the technique video was easy to follow. Happy Birthday Altenew! This is a very pretty technique. Your flowers look so soft and lovely. I watched the video and am wondering something. On that second layer that you want darker: do you let the paper completely dry before going back in our just dry for a little bit? I’m assuming that going back over it allows the paper to soak up more pigment thus making it darker. I want to try this. It really is a neat technique. Gorgeous and love your style! Happy Anniversary Altenew! LOVE the design and soft colours! FABULOUS video too, it was wonderful watching how you moved the colour around the petals! I had never heard of transparent watercoloring but I love the look you achieved. Thanks for the great video showing us how to get this look! I love this card. 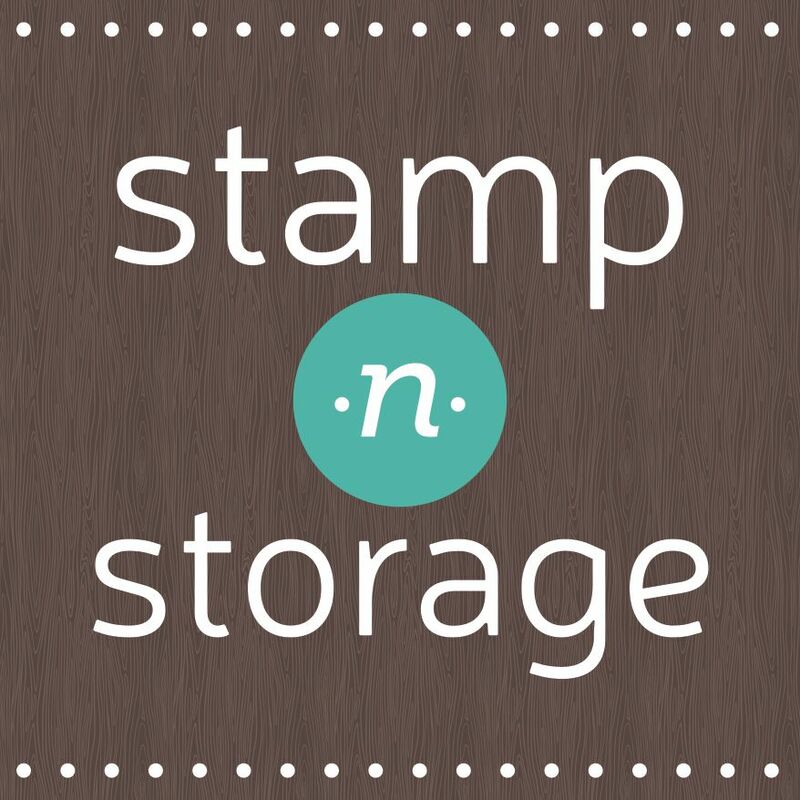 I am waiting to receive my Sweetest Pea stamp set. So I am very happy for the inspiration and the great video. Beautiful card! I love your technique! 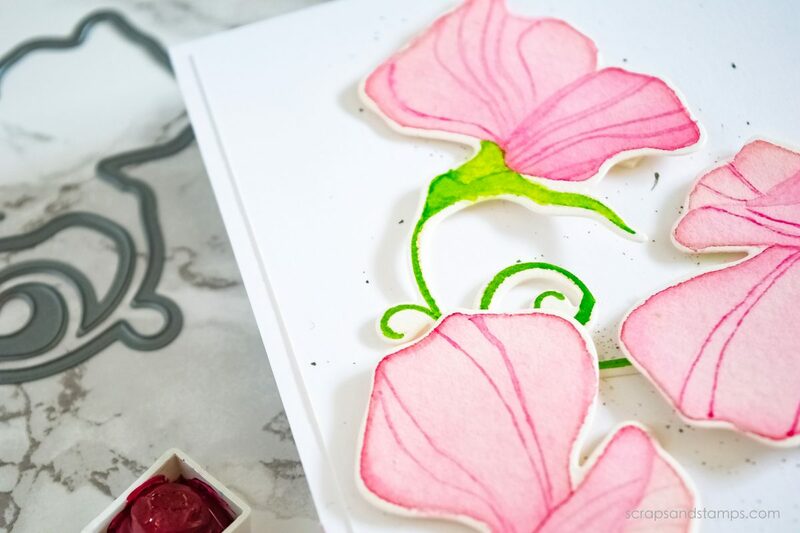 Gorgeous card – I must try this watercoloring technique! Fantastic card! I love the design! Beautiful!! Love the soft look to the water coloring! Beautiful card! Thank you for taking the time to do a video! It was very good! Happy Anniversary Altenew! such a delicate look you achieved! Such a pretty card. The coloring is stunning! I love how you did those watercolors! I have Twinkling H20’s at home & I love to water color with them! I love Sweet Peas & yours look so etherial with your watercoloring. This is a very beautiful card & I thank you for showing it to us. 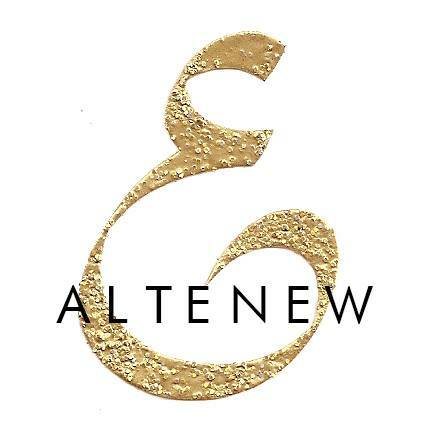 Happy 5th Anniversary Altenew! So pretty with the pink flowers. Thank you for the easy to follow video. Beautiful use of watercolors. Your card is beautiful and never heard of transparent watercoloring until I saw it on your post. Thank you for sharing.